Alright, fair disclaimer. Everyone I know not only loves Chick-fil-A, but it’s like a cult following obsession. So apparently this stuff is good and I just don’t have a taste for it. To be fair, I’m not really a fried chicken person. I do like chicken nuggets, but mostly after I’ve been drinking. Occasionally I’ll get a craving for McDonald’s crunchy chicken nuggets, but I’m not entirely sure those are meat anyway…. I ordered an 8 piece order of nuggets, and order of fries and a drink. Totaled about $6. At the Chick-fil-A at WSU everything’s ready for you. You have a limited number of options (all that was there when I was there were nuggets – 8 and 12 pieces, and chicken sandwiches, and then of course fries). The nuggets aren’t disgusting or anything. I just like my nuggets crunchy. These are more soft. 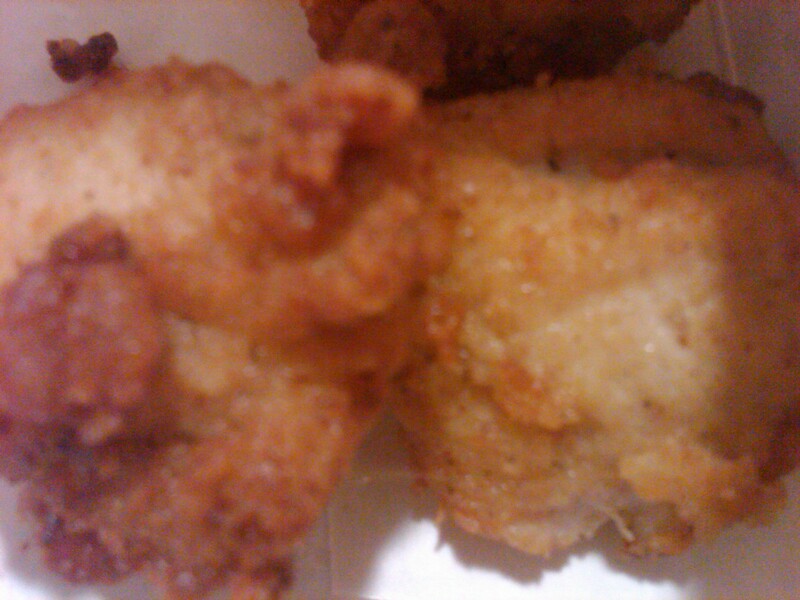 They’re little balls of chicken (wait, that sounds way wrong) that are battered and fried, I’d assume. The chicken tastes good, but I’m left wishing for some crunch. The fries, on the other hand are good. They’re nice and crunchy. The thing I like is they’re not stingy with sauce, and even offer it. NOT something the a-holes at McDonald’s do. They try to charge you for sauce. Effers. Wait, digressing. Alright, for those of you avid Fil-A-ers, tell me what I’m missing. There are some people at work who go to WSU every few months just to eat there. They swear it’s delicious. I don’t think I’ve had the same un-crunchy nuggets by coincidence. I think that’s just how they are served. They look crunchy, right? They’re just not. Sad face. I dipped both in buffalo sauce. Mmmmmm… Buffalo sauce. Chick-fil-A is gross. The kids occasionally want to eat there (there are Chick-fil-A restaurants all over TX) and I’ve only caved once. It was, at least on that day, so busy that they walked around the outside taking orders from cars that were wrapped around the building. I never understood the appeal. I am, however, kinda excited to one day (hopefully soon) try my first What-A-Burger. When the kids want to go, I simply say (or beg, sadly), “can’t we just go to Ci-Ci’s.” And that’s gross too. Your review of the student center has reminded me how much I miss that campus. Thanks a lot. I know. I go on campus at least once a semester for a committee I’m on there, and it always makes me miss campus. Which is weird. I don’t know why just walking on campus makes me miss school. Maybe yearning for days of yon? 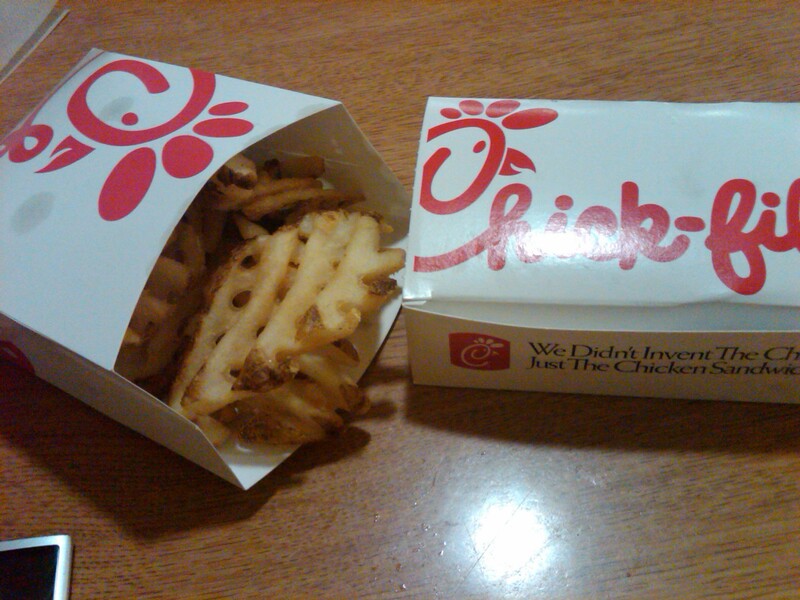 I definitely don’t get the appeal of Chick-fil-A. Or Ci-Ci’s. Although Kendra called in an order of their cheesesticks to go one time, and they were actually really good. Yum! Ci Ci’s cheese bread sticks are awesome.. Kelly, I’ve never eaten at Chik fil A, and I’m not sure I ever will.. It seriously doesn’t seem like anything I would be in love with, but i completely agree that people that do love it LOVE it! It’s so weird. I also agree, if I’m getting chicken nuggets, I’d almost definitely rather have mcd’s (and so would Connor). 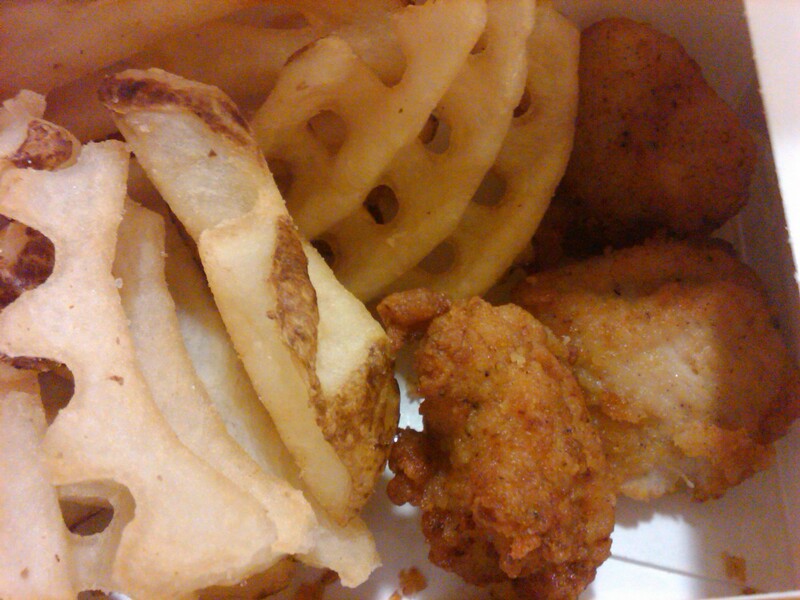 Well the fries do look good, but I trust your judgement on the chicken. 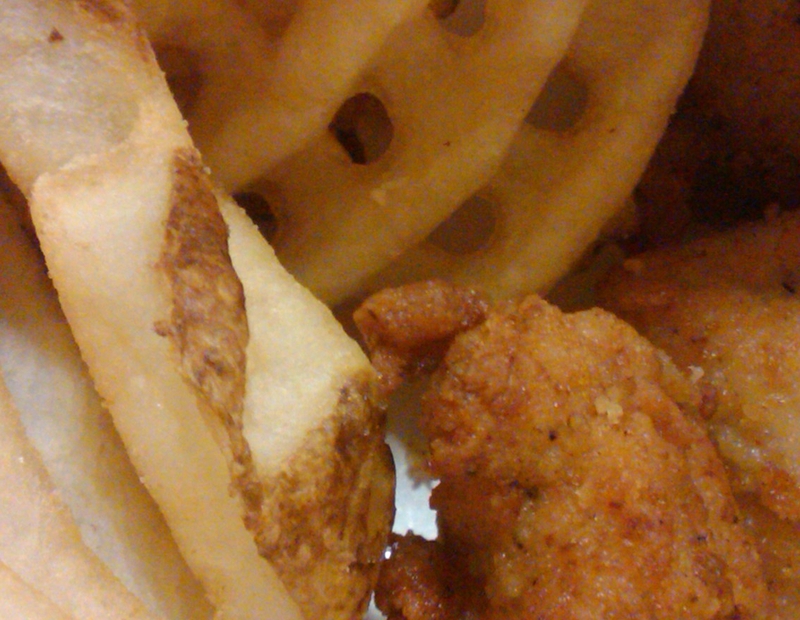 I haven’t met a waffle fry I didn’t like though. Man, not gonna lie. The balls of chicken look gooood! I’d try ’em, and then probably complain about them. But I wish I had a chicken ball right now. (: Haha, I just love saying it. Mmmmmmmm… Backyard Burger!! I miss that place. And the chicken does look good. If you don’t care if it’s not crunchy you’ll like it. The chicken itself tastes good, but to me it seems soggy since it’s not crunchy. Not that crunchy means it’s good and un-crunchy means it’s bad. I just look at it and expect crunchy and it’s just not. I think you people are mistaking a different part of the anatomy that is supposed to be *hard* (or, err crunchy)??? It’s in their genetic makeup people! ;) Or what do I know? Not much. Calling something a chicken ball unfortunately makes me kinda want to gag. ESPECIALLY when you say it’s a soggy chicken ball.